A music group's anti-piracy system has just sent Google the most staggeringly ridiculous DMCA notices the planet has EVER seen. If you aren't sitting down, please do so now. Remove tight clothing, open a window and get a glass of water. This one is absolutely epic. At least once a month TorrentFreak reports on the often crazy world of DMCA takedown notices. Google is kind enough to publish thousands of them in its Transparency Report and we’re only too happy to spend hours trawling through them. Every now and again a real gem comes to light, often featuring mistakes that show why making these notices public is not only a great idea but also in the public interest. The ones we found this week not only underline that assertion in bold, but are actually the worst examples of incompetence we’ve ever seen. German-based Total Wipes Music Group have made these pages before after trying to censor entirely legal content published by Walmart, Ikea, Fair Trade USA and Dunkin Donuts. This week, however, their earlier efforts were eclipsed on a massive scale. First, in an effort to ‘protect’ their album “Truth or Dare” on Maze Records, the company tried to censor a TorrentFreak article from 2012 on how to download anonymously. The notice, found here, targets dozens of privacy-focused articles simply because they have the word “hide” in them. But it gets worse – much worse. ‘Protecting’ an album called “Cigarettes” on Mona Records, Total Wipes sent Google a notice containing not a single infringing link. Unbelievably one of the URLs targeted an article on how to use PGP on the Mac. It was published by none other than the EFF. So that was the big punchline, right? Pfft, nowhere near. Going after alleged pirates of the album “In To The Wild – Vol.7” on Aborigeno Music, Total Wipes offer their pièce de résistance, the veritable jewel in their crown. The notice, which covers 95 URLs, targets no music whatsoever. Instead it tries to ruin the Internet by targeting the download pages of some of the most famous online companies around. 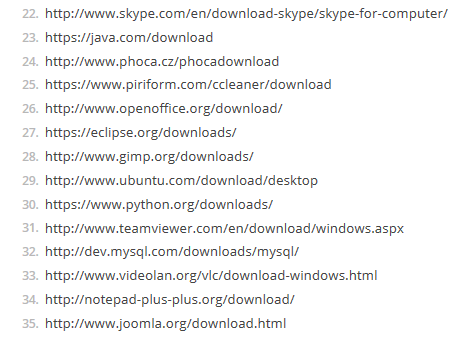 In no particular order, here is a larger selection of some of the download pages the notice attacks. ICQ, RedHat, SQLite, Vuze, LinuxMint, WineHQ, Foxit, Calibre, Kodi/XBMC, Skype, Java, OpenOffice, Gimp, Ubuntu, Python, TeamViewer, MySQL, VLC, Joomla, Z-Zip, RaspberryPI, Unity3D, Apache, MalwareBytes, Pidgin, LibreOffice, VMWare, uTorrent, WinSCP, WhatsApp, Evernote, AMD, AVG, Origin, TorProject, PHPMyAdmin, Nginx, FFmpeg, phpbb, Plex, GNU, WireShark, Dropbox and Opera. We’ve said it before but it needs to be said again. Some people can’t be trusted to send takedown notices and must lose their right to do so when they demonstrate this level of abuse. The sooner Google kicks these people out the better.